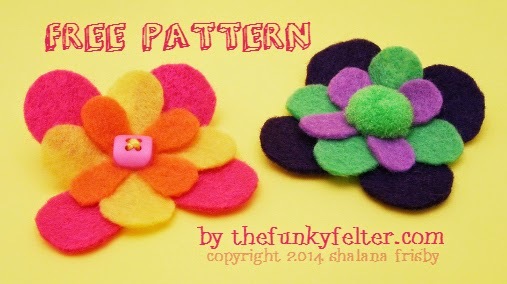 This super duper easy little felt flower craft is great for kids and adults. Use up your felt scraps to make several for embellishments. These also make adorable children's hair clips or headbands. For a home decor project, try attaching them with some ribbon to a vase or upcycled tin can. You can either stitch these by hand or make it even quicker by using your hot glue gun to whip through a pile of these for decorating. 2. Cut out the three different size layers of felt petals for the flower. Layer the petals from largest to smallest centered on top of each other. 3. Use hot glue to adhere the petal layers together or stitch with needle and thread. Attach a button or other embellishment in the center. It is just that easy!